FxPro takes an attractive marketing approach. Will others follow? FxPro recently unveiled a huge three-year deal with the Premier League Aston Villa Football Club as a Commercial Partner, beginning in July 2010. Villa refused to reveal the exact amount, but confirmed it was more than the previous record £10 million three-year deal with Nike. This deal was followed by other high-profile sports sponsorships: Fulham Football Club, the Virgin Formula 1 team, the BMW Sauber Formula 1 team, the IRC rally team, the WRC rally team, the FxPro Rally Cyprus and the “super star” Sunday golf tournament. It has become popular for Forex Brokers to sponsor Formula 1 teams, for instance: MIG Bank for the MERCEDES GP PETRONAS Formula 1 Team, FXDD for Red Bull Racing Formula 1 team or other car racing teams (FXOpen for the 1 Malaysia FXOpen Drift Series) as part of their marketing effort, but nobody has put the main emphasis of their marketing on sponsorships to the same extent as FxPro, who declared on their website: ” At FxPro we believe in our sponsorship efforts and partners to help raise awareness of the FxPro brand on a global scale”. FxPro’s marketing plan is less focused on introducing low spreads or a specific trading platform, which completely sets it apart from its competitors. 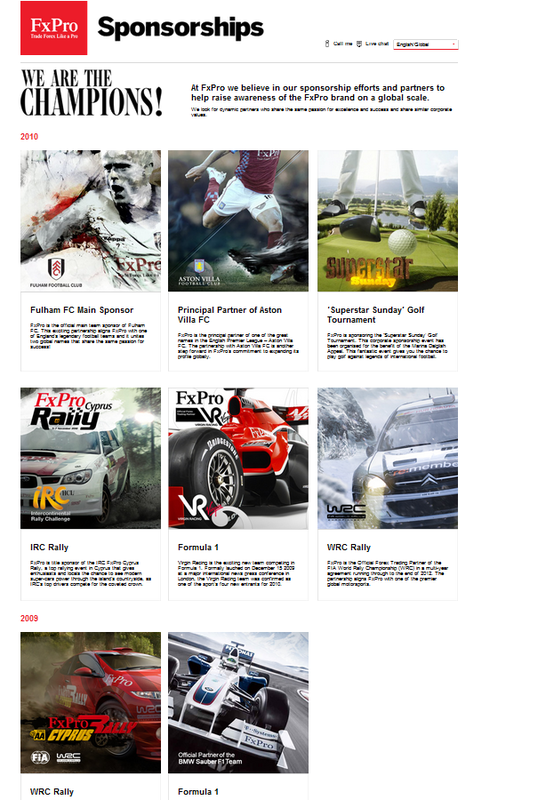 Rather, FxPro’s marketing agenda seems to focused more on their sponsorships. This is made particularly clear on their website where FxPro introduces their sponsorship to visitors, and emphasizes the enormous deal with Aston Villa. The high costs and the potential of high visibility associated with such deals make for an interesting move by FxPro to brand themselves through sports partnerships, especially as this is an offline marketing and most of Forex brokers prefer to stick to the measurable online marketing niche. Does this herald the start of a trend in the industry, and will others follow?